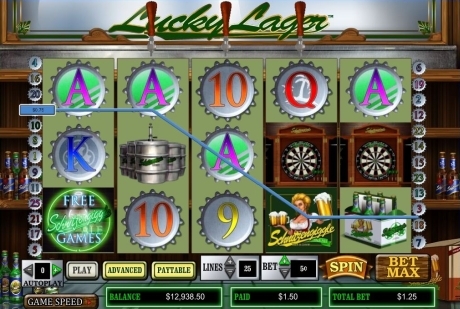 Those who don’t set their hopes very high regarding the annual celebration known as Oktoberfest but love slot games, will find Intercasino’s theme game very exciting. 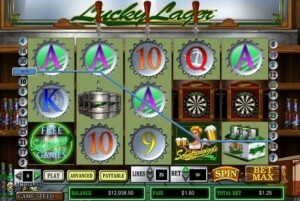 It goes by the name of Lucky Lager and it promises to make players rich, or at least keep them entertained with minimal expenses. Whether you are familiar or not with the atmosphere specific to Oktoberfest, the one re-created by the slot game is as accurate as it gets and definitely a treat for the eye. Beer is the central symbol, which explains why most of the prizes are connected to it to some extent. The wild symbol is in fact a glass of beer and it can appear only on the second third and fourth reels, triggering a flood of beer. The lower it appears on an active reel, the more generous the prizes will be and that’s why everyone hopes that the wild symbol will pop up on the bottom roll. When this happens players will cash in on a lavish amount, but even it pales in comparison to the winnings generated by the waitress symbol. Up to 750 coins are instantly transferred into the player’s account when 5 waitresses are revealed. This slot game is developed by Cryptologic, a software producer that is known to favor highrollers and with a maximum bet of two hundred and fifty coins per spin, there is plenty of room for big spenders to maneuver. At the opposite end of the spectrum we find the low rollers who will take full advantage of the 0.01 credit minimal line bet. Perhaps the most entertaining sign is the dart board, because when it appears it marks the beginning of bonus rounds. Players need to aim for the bull’s-eye and score as many points as possible with the darts they throw, to increase their profits. Money makes the world go round and people tend to forget that in order to reap generous benefits, they need to invest in the first place. The prospect of winning a massive amount at slots is of course nothing more than wishful thinking, because the odds are stacked against the players. 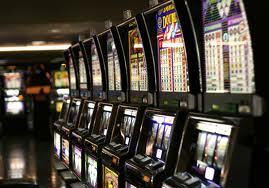 The machines are known to pay back less than what they intake, which might be a little depressing but represents no surprise due to the fact that casinos needs to stay profitable to operate. Knowing all of these facts shouldn’t have a deterring effect on players, because despite the fact that they are underdogs they can occasionally win big. Some will have their lives changed around by a huge jackpot others will simply be marginal winners, and then of course there are some who will lose on the long run. All of the aforementioned players need to have a budget that they replenish on a regular basis, instead of depositing money before each playing session. It is much easier to go on tilt and lose significant amounts when you don’t have a plan, so if you don’t want to see all your money going down the drain make sure you play in bankroll. Differentiating between the money used for covering living expenses and the funds spent for activities associated with fun is just as important as knowing how to play at different slot machines. Chris Wiseman makes some powerful observations at slideshare.net/ChrisWiseman/importance-ofusingbankrollmanagementforslotmachines and those who are not yet convinced about the importance of proper money management and bankroll administration should check them out.